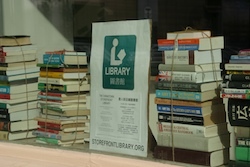 When the Storefront Library opens on October 15, operating hours will be TUE-THU 11am-6pm, FRI & SAT 10am-5pm. The newly revised schedule will keep the library open more hours overall, and it will allow us to maximize the number of staff, interns, and volunteers working in the space. In addition to regular operating hours, watch for special programs which may be scheduled later in the evening. As we continue to raise funds for the project, our goal is keep the Storefront Library open, staffed, and engaged with programs for as many hours as possible during our three-month stay. Check our web site for the latest information about schedule.